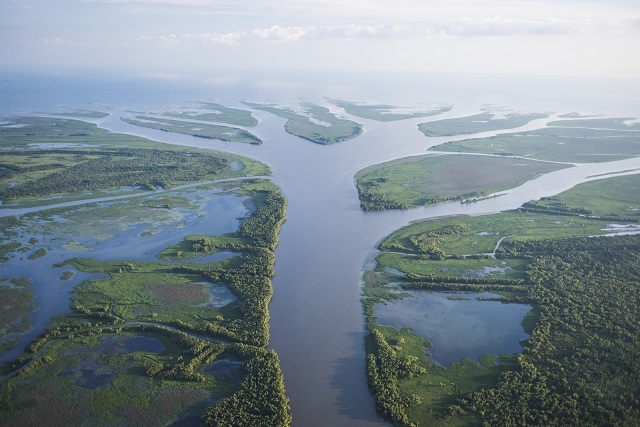 Aerial view looking south toward the Gulf of Mexico down the Wax Lake Delta, Louisiana. Photo © Carlton Ward Jr. In the 1990s, New York City needed a new water filtration system to serve its nearly 8 million people. But the prospect of spending $6-10 billion on a new water treatment plant, and another $100 million on annual operating costs, was daunting. So, city officials took a closer look at the source of their water – the Catskill Mountains. Water from the Catskills flows through 120 miles of forests, farmland and towns to reach New York City. When that landscape is healthy, it acts as a natural purifying system, but certain development and agricultural practices can result in poorer water quality downstream. For city officials, reaching out to local farmers and landowners and compensating them to restore and conserve lands in the watershed, combined with some land acquisition, proved to be significantly cheaper than building and operating a new treatment plant. New York’s example showed the benefits of public-private partnerships in such situations, and demonstrated that unlocking nature-based solutions can be cheaper, more efficient and produce additional benefits compared to conventional built, or “grey,” infrastructure. For The Nature Conservancy, this was the moment of inspiration for water funds. Given that more than 40 percent of source watersheds worldwide have been degraded by development, resulting in impaired downstream flows, nature-based source water protection can be one of the most effective ways to improve water quality and quantity for urban areas. A study by The Nature Conservancy estimates that four out of five cities could improve water quality using nature-based solutions, and potentially 1,000 cities globally would see a positive return on investment based on reductions in total utility expenditures. Furthermore, these solutions often deliver other forms of value, such as increased agricultural yields, improved community health and carbon sequestration. One example is the Upper-Tana Nairobi Water Fund, which helped reduce erosion and nutrient runoff into Nairobi’s water supplies by helping upstream farmers implement practices that both reduce soil run-off and increase agricultural yields. Today, such activities in the watershed help sustain the water supply for 9.3 million people and will generate an estimated $21.5 million in long-term benefits for local communities and businesses. Since we launched the first water fund in Quito, Ecuador, in 2000, we’ve established 34 water funds around the world, many of which help secure urban water supplies, with 30 more in development throughout Latin America, North America, Africa, and Asia. But this is not enough. By 2025, at least two-thirds of the world’s population will likely be living in water-stressed areas. The question we face now is, how do we implement these solutions at the scale needed to truly make a dent in global water insecurity? Of course, it is agriculture and industry – not domestic use – that represents the vast majority of water consumption. Businesses with high water needs have an enormous interest in ensuring they have stable water supplies and can have an equally enormous impact on global water security. The utility company Veolia, for example, a global network based in France, is exploring how changing agricultural practices and ecosystem enhancements can ensure more sustainable water supply. Another, Suez, which does work across five continents, is incorporating wetland restoration into their practices to improve water quality and reduce operating costs. To date, more than 100 corporations have invested more than $38 million in water funds. Having more private-sector actors invest seriously in nature-based solutions – and having city and state regulators increasingly realize the benefits of these solutions and incorporate them into government oversight – can help us move the needle on these challenges. On top of that, we can protect ecosystems that deliver a range of other services, including climate mitigation, increased agricultural yields and improved community health. This goes beyond providing clean water – it’s about fundamentally improving sustainable human development around the world. Nature can deliver better water security for more than 1 billion people. It’s an ambitious goal – but with the right partnerships and stakeholders involved we can have a measurable, positive influence on planetary health overall. Andrea Erickson is Acting Managing Director of Water Security at The Nature Conservancy.